The new Primavera is blatantly a new Vespa that’s been named after a classic many of us know and love. So will it also become a legendary scooter? The new front end setup may just make that so…. While the Super Sport version of the GTS 125 and 300 was simply stickers, and the retro-inspired Vespa S passed under the radar for most, the new Primavera has certainly got people talking. What, you mean you didn’t associate the GTS Super Sport with the Vespa SS180 or the Gran Turismo of old? Or the square headlight version of the automatic LX with the original Vespa S of the 1960s? Maybe that’s because they were little more than cosmetic makeovers of current models, whereas this Primavera is a brand new Vespa. Although we won’t always admit it, many Scootering readers do have a soft spot for modern Vespas, even if they think they’ll never ride one of these new fangled, automatic scooters. Ever. Unlike pretty much any other scooter brand today, the Vespa has a pedigree that can be traced back via an unbroken line to the very first model of 1946. And as the people at Piaggio reminded us at the recent road test launch in Barcelona, it is the only manufacturer to introduce a brand new ‘all-steel scooter’ in 2013 (probably in 2014 as well, but you can never be certain). 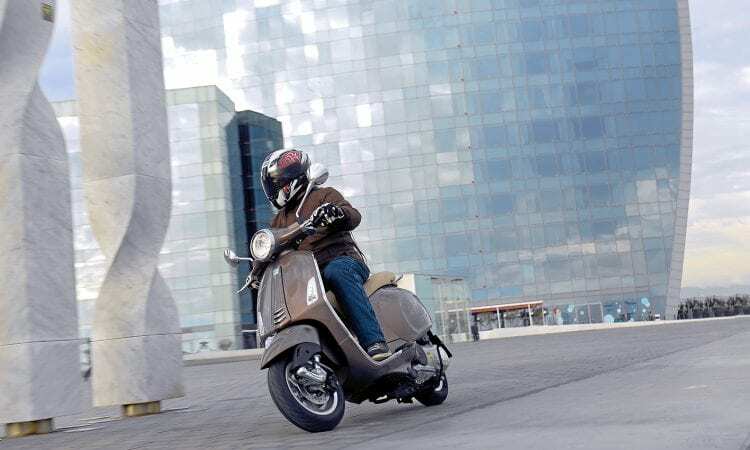 The Vespa has also retained its parentage within the Piaggio group rather than being a brand name that’s been passed around, repeatedly sold to the highest bidder like an ageing thoroughbred stud, devalued by every new sale. The Vespa’s overall style has remained constant, and while things have certainly become more modern since the ET4 arrived in 1996, the Vespas of today still have that certain something. And so to the new Primavera. Influenced by the limited edition Vespa 946 that arrived in the showrooms mid 2013, it will replace the Vespa LX in the range. It’s a mass produced scooter and as far as the European markets are concerned (as well as America and Australia among others), our Vespas are still produced in Italy. Yes there are parts within each model that will have originated from farther east but, like all manufacturers these days, Piaggio has to remain competitive. You don’t think that every component of a Volkswagen-owned Bentley motor car is 100% made in Crewe, do you? the latter I threw a leg over in Spain for a ride. The 125 is a fuel-injected three-valve engine, first used in the last of the LX range and from experience a powerful enough motor with a good top speed and impressive fuel consumption to go with it. This, we were told, has been tweaked further to make it even less thirsty, which can only be a good thing. Visually you will notice the Primavera has a far more upswept rear-end than others in the range. The Vespa is evolving, as it has done over the last 65 years or so, yet more so now than when the ET4 was launched in 1996, the designers are looking to the past when visualising the future. At the press conference we were told how its styling echoes that of the original Vespa Primavera of 1968, the round headlight with chrome trim, polished effect switch housings on the handlebars, clamshell like speedo, all neatly surrounding the modern digital display on the dash. Further down, the legshields are more shapely than ever before on a modern Vespa, which to this Vespista’s eye appear far more stylish than the ET4, LX or even a GTS. No it’s not an original Primavera, and we’re not going to see Piaggio make one like that again, but this ain’t a bad looking scooter at all in my opinion, if you can cast that old ET3 out of your mind for a minute or two. The seat is comfortable, there’s no doubt about that. It feels well padded and looks like a decent piece of kit, even when opening and closing it. These are features that generally set a Vespa scooter apart from the rest. The riding position feels very Vespa-like too, upright yet natural and relaxed, even when giving the scooter a hard time. Before you get there though, you must first familiarise yourself with this new scooter through a chaotic city centre on a Wednesday afternoon. Scooters are king in Barcelona, but the Primavera does at first appear lacking off the mark compared with the locally thrashed Suzuki Burgman 400s. It is only a 125 however, and after you’ve got used to it a little, it’s not really so lethargic. Instead it takes off more steadily, pausing a moment to catch its breath at around 40-45mph or so, and then it continues. Whether by squeezing some extra mpg out of the engine acceleration has been sacrificed I don’t know, but it did hold its own against comparative scooters from a standing start, often winning against unsuspecting competitors. Out on the ring road, as dusk began to fall, winding up the factory fresh engine saw a top speed around 110kph on the speedo (approx 68.75mph) before traffic slowed things down. There’s only so fast I want to filter among someone else’s rush hour. Going on previous experience, once loosened up I reckon it will have a little more to give. Fast cornering was steady enough without causing you to slow for any reason; the handling feels positive. The Michelin CityGrip tyres also inspired the rider (in the dry at least). While I will confess I didn’t really notice much difference with an 11in rear tyre over the LX’s 10in, the Primavera did feel a bigger machine once sat on board. Cleverly, however, the seat and the floor have been sculpted a little to allow riders to get their feet down more easily and remain in control. Those who found the Vespa LX too tall may well discover the Primavera suits them better. The improved front end worked well too – the scooter not diving as much under braking. Congratulations must therefore go to the boffins at Piaggio’s R&D department. The rear suspension is a single unit by the way, adjustable for pre-load as most are these days. The new Vespa also features a redesigned engine mounting system which, together with the new front suspension, reduces vibrations making for a more comfortable ride. Brakes are impressive too, tested with a few close calls. The traffic in Barcelona, especially when everyone appears to be rushing home together for their tea, is chaotic to say the least. But no matter how much cutting and thrusting was done through the congested streets, the most alarming thing for anyone (read pedestrians) was the squealing of the rear tyre as the back wheel was consciously locked by deliberate overzealous application of the left-hand lever. Yes, we were intentionally sliding the back end round at some junctions. Sorry. In their defence, the brakes did everything that was asked of them. The front disc offers feel and full progression, while even one of the motosickle journos at the launch who ‘claimed’ not to have seen a drum brake on a new two-wheeler for years relented to the fact that this little 125cc Vespa didn’t really need a rear disc anyway. Piaggio told us that an ABS version is on the way too (we don’t know when) and that will retain the rear drum. Why fix what ain’t broke? Fit and finish are always areas under close scrutiny, especially with a premium priced product, but it appears pretty good here even under a critical eye. Yes, some areas are maybe not 100% perfect, but then no mass produced vehicles are. That’s called ‘manufacturing tolerances’. Piaggio has thought about a few things too, for example the odometer reset is now on the switchgear and easily operated by your thumb. The speedometer and dash are lit up sufficiently at night as well, yet subtle enough in blue not to blind you. This is another area which suggests sophistication; another box presumably ticked back at Pontedera. The glovebox is quite deep and spacious, deceptively so I’d say. And for the first time on a modern Vespa I can just about get my XL sized full face Shoei under the seat of the new Primavera. It’s a tight squeeze, and I’d never recommend anyone leave their lid there for security reasons anyway, but it’s good to know that luggage capacity has been increased. So will this smooth looking, smooth riding ­Vespa win the hearts of the scootering community and commuters around the world? Personally I think it could do, with only the initial purchase price potentially putting some people off at first. But Vespas still hold a higher resale value than most other modern scooters, and being all-metal they are far more robust too… so taking these factors as well as longer service intervals into consideration, the cost does not seem so extreme in the long term. 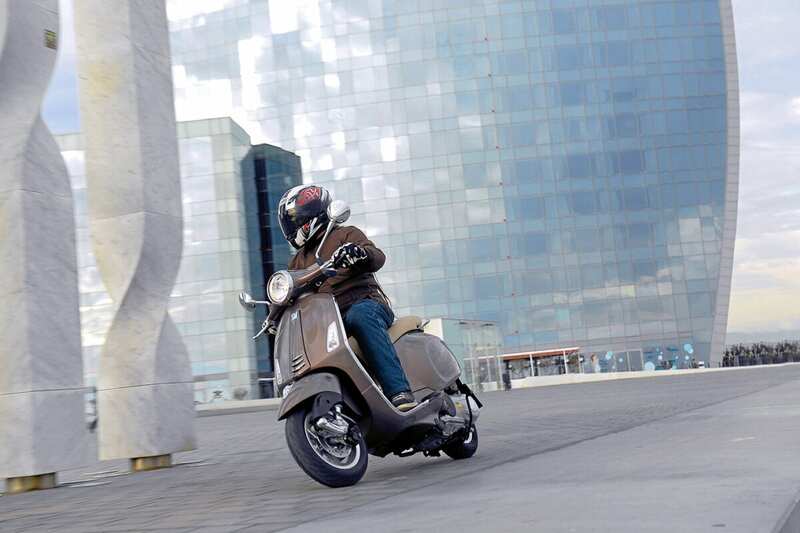 The Vespa Primavera also manages to offer both commuting functions as well as being a stylish leisure vehicle too, and for many that’s more than enough. After all, that’s why many of us use our scooters both daily and for rallies and events at weekends. For me, if I was still commuting into London every day then this would suit my needs perfectly, and I wouldn’t feel embarrassed riding it to a scooter rally at weekends either. It’s certainly faster than my old Vespa 90 was.